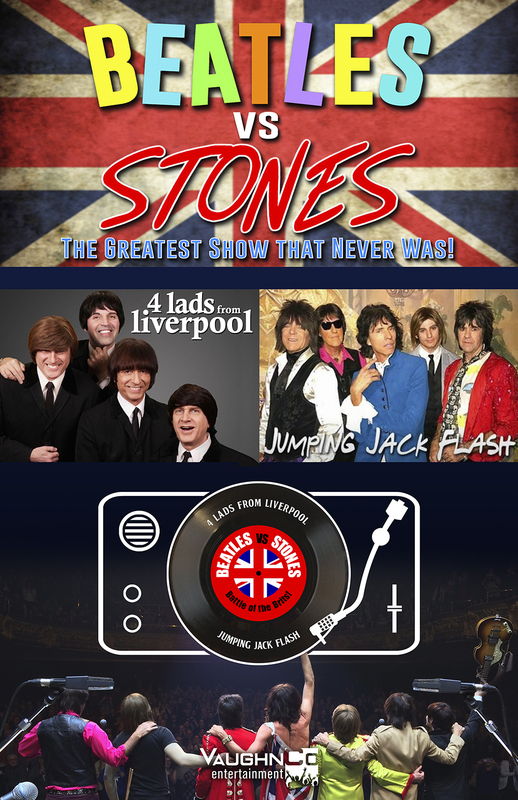 VaughnCo Entertainment is proud to present the ultimate Beatles vs Stones tribute show. Don’t miss the story of the infamous rivalry between the two greatest bands of the rock & roll era, and is a thrill-ride of a show! The show begins with The Beatles in their famous black suits, performing the songs that changed the world in so many ways. They are followed by the Rolling Stones, also in their early 60’s “look”, and featuring Mr. Brian Jones on his famous teardrop guitar. As the show (and historical timeline) progresses, you will witness the Beatles in their Sgt. Peppers wardrobe, the Stones in mid-60’s psychedelic finery, and then finally the fashions of the late 60’s/early 70’s. The grand finale is a mash-up of both a Beatles and a Stones hit—yet another back & forth clash of these musical titans, and culminates with a cast-member asking the audience, “well who won tonight? was it the Beatles or the Stones?”. In the end though, it’s the audience who won, because they had such a magical experience!